The Good Times Blog: Has Fred Phelps Franchised? Is it possible that Fred Phelps has opened up a branch of the WBC in Israel? It seems unlikely, but there is evidence that it is possible. Shlomo Benizri, an Israeli MP from the super-Orthodox Shas party, blamed recent natural disasters in Israel on..the gays (is it me or are the gays shockingly powerful? Like superhero powerful. I have a theory that they funnel house music straight into the depths of their souls where they pack it so tightly that eventually it erupts in the form of earth quakes, tsunamis, bird flu, and shows on HGTV...it is a working theory but it has teeth). While speaking on the issue of disaster preparedness, Benizri told a committee that Israel should "stop passing legislation on how to encourage homosexual activity in the state of Israel, which anyway brings about earthquakes." There are lots of things I could say about this, like, maybe this guy is right...I mean look how many earthquakes San Francisco has...but I think I'll just leave it at "Shlomo is an awesome name". P.S. The picture above has nothing to do with Israel, but it is pretty funny. 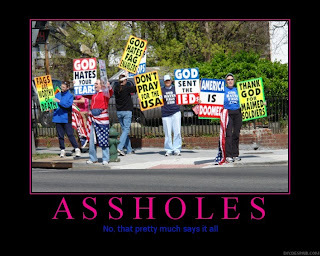 Um, the one sign in the photo that I don't really understand is the one that says "God loves maimed soldiers." A close second is "God hates your tears." What happens if a maimed soldier is crying? What a predicament in which God would find himself, if these loonies' theories proved true... Idiots. I think you may be on to something...that house music does make people do terrible things. I knew a Schlomo in real life. It was hard to call his office and ask for him. Thank goodness I only had to meet him once. That's terrible to say, isn't it? I would love it if gays could actually cause natural disasters. That would be so cool! Shlomo is committing a common logical fallacy--confusing correlation with causation. What if gays just tend to congregate near earthquakes? Maybe earthquakes cause homosexuality? Shlomo needs to design a good double-blind randomized study with a solid control group. Aren't You Overreacting, Just a Tad?